We’re right in the middle of National Kitchen and Bath Month and National Toilet Tank Repair Month … so it’s a good time to consider the question of when should you replace your toilet? Sign #1 – Ongoing leaking problems. Hairline cracks in a tank or bowl, bad seals or broken flanges can all potentially cause leaking problems. This is an important issue, because if your floor becomes soft from water leaks it can attract mildew, rot or create structural damage. Sign #2 – Your water bills keep growing. If you have an older toilet, you may be using up to 6 gallons of water per flush. Newer, more water-efficient models are available that use just 1.6, 1.28 or even 1 gallon per flush. Sign #3 – Increase in clogging. Sure, most toilets may clog up once in awhile if large amounts of waste are deposited. However, if you find the plunger is your new best friend and you’re using it often, then it’s time to get a more powerful toilet — like the DENALITM Power Flush toilet — that can move 1,200 grams of waste (20% greater than the highest MaP rating) with just 1.6 gallons per flush. Sign #4 – Wobbly or rocking toilet. 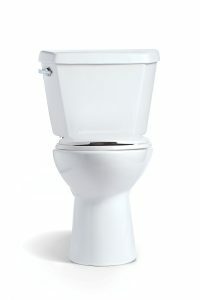 Your toilet should be firmly secured to the floor and not sway or move when you sit on it or get off of it. While a wobbly toilet could simply mean some bolts need adjusting, it can also be an indicator that the lifespan of your toilet has come to an end. Sign #5 – Fix versus replace. If you have a plumber give you a quote for fixing your toilet that appears high, ask what the cost of a replacement toilet would be. Oftentimes it’s less expensive to replace an older toilet than have it fixed. The bonus is that a new toilet will most likely come with upgrades you don’t currently have — such as being more water efficient, sitting higher for comfort and/or having stronger flushing capabilities.